Look for the sign on the lightpost. The naming of Okîsikow Way was led by the Stolen Sisters Awareness Walk & Movement and the Centre to End All Sexual Exploitation (CEASE) to honour women who have been victims of violence. Indigenous women are five times more likely to die of violence than other Canadian women. Nearly half of the more than 1,180 reported cases of missing and murdered Indigenous women remain unsolved. 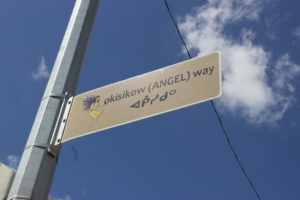 Okîsikow is “angel” in Cree. 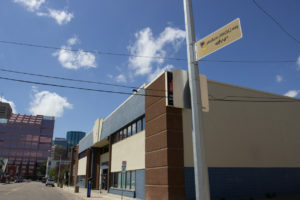 After Iqaluit in Nunavut, Edmonton is the second city to name an Angel street. The sign was designed by artist and activist Gloria Neapetung.